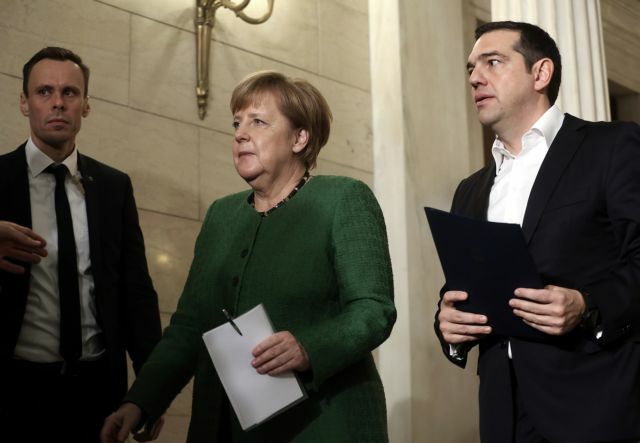 Visiting German Chancellor Angela Merkel praised Prime Minister Alexis Tsipras for his decisiveness in concluding the Greece-FYROM Prespa Agreement and expressed her satisfaction on the progress that has been noted in the Greek economy after talks in Athens today. “I am grateful to Alexis Tsipras for working with [FYROM PM] Zoran Zaev for a solution to the naming issue. The name North Macedonia affords clarity. This solution will benefit not only Greece and North Macedonia, but all of Europe Merkel declared, making sure to use the name by which FYROM will be known if and when the Parliaments of both FYROM and Greece finally approve the agreement. 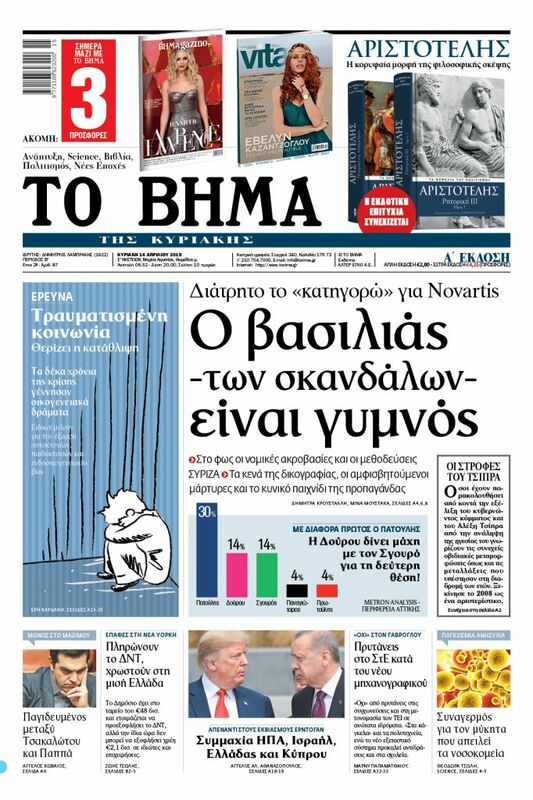 Merkel expressed an uneasy surprise when asked by a German reporter to comment on whether Berlin acquiesced to scrapping Greek pension cuts in return for Athens ratifying the Prespa naming accord, which she categorically denied. Effectively, the German Chancellor was answering the unprecedented allegations of main opposition New Democracy leaders Kyriakos Mitsotakis, who essentially pointed the finger at Berlin in his effort to denounce the government. “Today, you are coming to a different Greece [than her last visit in 2012] which after many difficulties managed to transcend the crisis,” Tsipras told Merkel in on-camera remarks before their talks. The two leaders in joint statements also acknowledged the very tough patches in Greece-Germany relations over the past several years, and Merkel offered sympathy for trials of the Greek people in enduring the exceptionally strict fiscal adjustment programmes (which Berlin as economic leader of the EU imposed on Greece). “The Greeks had a difficult time over the last years and I am especially pleased that Greece transcended the problems,” said Merkel, who would like to portray Greece as a positive part of her legacy. For his part, though he credits himself with shepherding Greece out of the strict bailout memorandum era, the PM acknowledged that Greece is still suffering from the deep wounds of the crisis. “We are exiting the crisis with serious wounds which we are gradually healing, but with society standing on its feet. Greece is leaving behind the era of deficits,” he said. While not referring directly to the government’s generous social spending and handouts, Merkel made sure to underline the serious lingering problems that must still be addressed. “This is not the end of reforms but rather the beginning. The problems have not entirely been transcended,” she conceded. “The EU-Turkey agreement has not been implemented in the manner that we would have liked, including the matter of returns. We shall work with Greece to improve certain points of the agreement,” Merkel said. Tsipras complained that other EU partners have not shouldered their share of the refugee and migrant burden, and he called for a comprehensive European policy .for asylum and migration, and a reform of the existing system.